We finally got a long stretch of dry weather and finished our new window glass installation today! What a big difference between the new tinted tempered and the old clear (actually kind of yellow!) glass. It’s like the old trailer went from outdated glasses to hip sunglasses. Huge thanks to Dwight at Glass Doctor of Knoxville for helping us through the process, and special-ordering our glass. 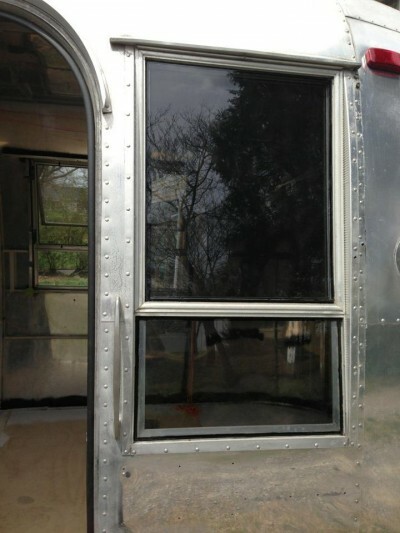 Airstream window glass wasn’t something they had ever done before, so we promised to provide them with some photos and not hold them responsible if it didn’t work out for us! They were fast, friendly, affordable and he packed up all 10 pieces of glass very carefully for a safe drive home from their shop. Breaking the old panes to get them out made us feel better about our decision to spend the extra money on tempered. It may be overkill, but it sure didn’t take much to crack the old “non-safety” glass, which then rained glass shards upon us, even after taping them as a safety measure. Jason had an ER visit and stitches last year from a seemingly innocent drinking glass that exploded, so we’re a little overly cautious now! This old trailer is getting classier by the day!